Launched on the market in 2012, Dimpless® is the outcome of several years of research. At the origin of its development, there was an idea: to highlight the recognized anti-fibrotic properties of superoxide dismutase (SOD) and place them at the service of a universal female condition, namely cellulite (Reported by several hundred scientific publications, the anti-fibrotic potential of SOD is such that in the 1990s, a purified version was used in the treatment of radiation-induced fibrosis). As with all our research projects, the path to clinical trials necessarily involves a phase of testing on a preclinical model. This crucial step allows us to validate our hypothesis and to understand how our active ingredient works. 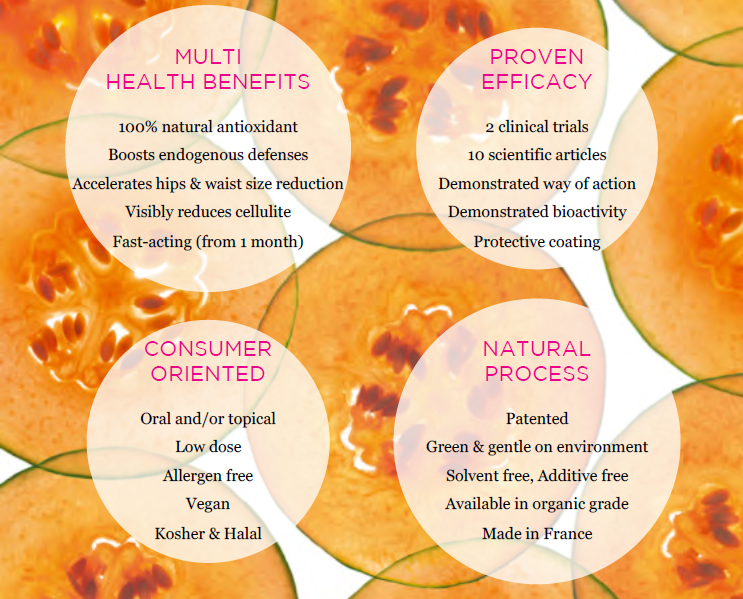 In the case of Dimpless®, the cocktail of bioactive molecules contained in our melon concentrate leads to a synergistic action on cellulite, targeting not only fibrosis of connective tissue, but also lipolysis and hypertrophy of adipocytes. It is undoubtedly thanks to this original mode of action that Dimpless® has proven itself for the second time. While cellulite is not considered as a medical condition, it is today probably the most widespread beauty concern as 1.7 billion women are affected, regardless of race, social circumstances or age (85% of women over 20). In Europe, it potentially concerns 166 million women and in North America, 118 million women. Projections for the period 2018-2028 indicate that the United States, currently the market leader in anti-cellulite treatments, will maintain its position with a compound annual growth rate of 8.1% for a market worth $2,100 million. Europe is the second-ranked market leader for anti-cellulite treatments. The majority of consumers globally are adopting a holistic approach to their health and weight management, meaning they expect integrated solutions that befit their lifestyle and habits. In addition, a rising awareness about health and environmental issues leads consumers to look for plant-based ingredients, which they consider safer for their health but also for the environment. Introduced to the market in 2012, Dimpless® is one of the first oral ingredients for cellulite treatment, now benefiting from a doubly clinically demonstrated efficacy on cellulite. Natural, low-dose, safe and environment-friendly, Dimpless® is able to meet the needs and habits of today’s consumers and offer an effective alternative to traditional solutions. Cellulite results from a metabolic disorder of the hypodermis. This orange peel-like appearance is explained by two major events, fat cells hypertrophy and corruption of connective tissues, which are both closely linked to oxidative stress. Because the most efficient antioxidants are those produced by our body, Dimpless® stimulates the expression of endogenous antioxidant enzymes in the entire organism, attacking the problem of oxidative stress at its root. Dimpless® is a powerful antioxidant discovered unexpectedly in 1989, when French melon producers observed that a new variety of Cantaloupe melon showed an impressively long shelf life. SOD B® is only found in this unique melon variety: grown in France and non-GMO, with the utmost care by trusted producers, thoroughly selected, passing through a solvent free, patented natural process. Thanks to a patented coating technology, Dimpless® is fully protected and bioactive. Dimpless® is also available in organic quality and may have potential for topical application.